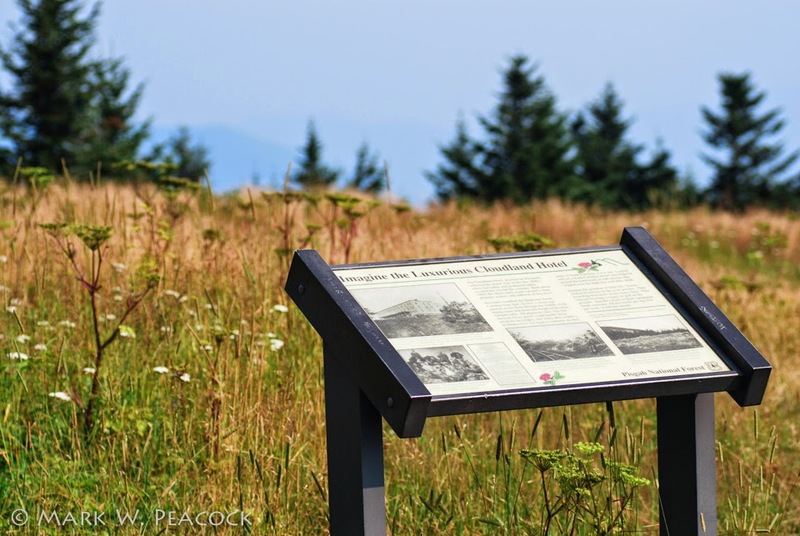 For directions and more information of all there is to see and do on Roan Mountain, click here. to the land of the sky. where the rivers are born. east of the Rocky Mountains. What type of camera do you use as I am looking for a new one. Hi Sandra - Glad you like the blog, thanks for visiting! If you scroll down, I just included a short section in the right column containing "My Camera Equipment." I've never regretted getting the Nikon D80. But I'd recommend you begin your camera shopping by reading the reviews on dpreview.com for Canon XT and XTi, as well as for Nikon D40, D40x and the D80. Good luck! Mark, Grandma Gouge's mother worked at the Cloudland Hotel! I am also related to the surname Gouge! What part of the South does your family come from? I'm originally from Illinois, I moved here 12 years ago (and fell in love with this area!). 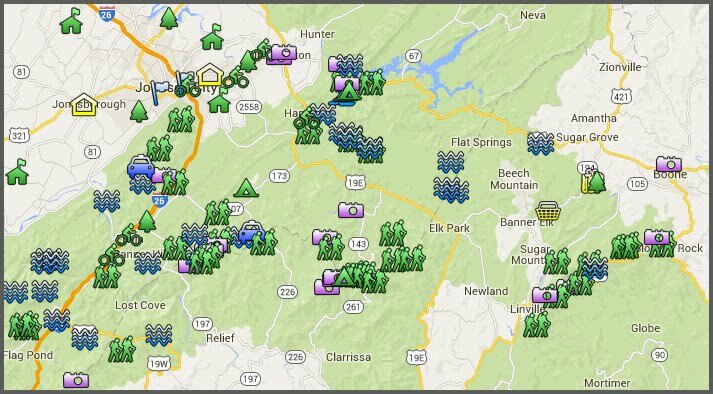 The Gouge's that I know from church are from the Roan Mountain and Pinecrest areas of Carter County. eggs to the hotel. She was so impressed with the waiters, dressed in white coats, carrying big trays above their heads from kitchen to dining room. My Mom's Uncle Lonnie Cook had a country store on the road leading to Roan Mountain. As a child have fond memories of his store and our visits with him there. I grew up in a house in Burbank, at the foot of the Roan, and was told that the house was built out of lumber from the Cloudland Hotel. I can still remember the lumber celings in the house. I would love to see more pics of the hotel and know more about the Gouge relatives that worked at the hotel. Thanks for the photos. My ancestors (from my father back to the 1790s) lived in under the Roan in the Big Rock Creek area in NC. As a child, I was introduced to the magnificent Roan, and although many miles and states away, I remain in awe of this glorious place. Years ago, I found handmade nails where the hotel stood, and a friend found a wooden bowling ball down from the hotel in the woods. I was told by an old timer that when the hotel ceased to operate, the bowling balls were thrown down the side of the mountain. Also, did you know about the main dining table? It had a NC/TN state line painted down the middle of it. 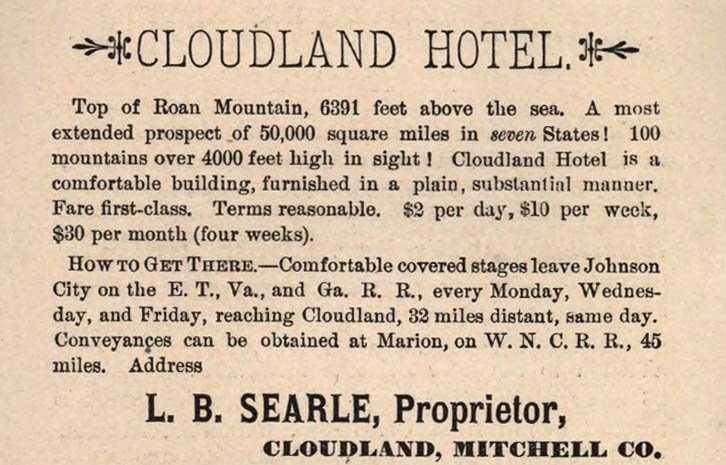 Does anybody have any information about the original Cloudland Hotel in Mitchell County NC at the end of Gouge Cove Rd? From what I'm finding, it was the first one built back in the 1870's or so. It was a 20 room hotel and later abandoned after the one on Roan Moutain was completed. Will they ever re-open this trail!?!?!? The original plan was to have the road and trail construction at the top of Roan be completed by the Rhododendron Festival in June 2011. I haven't heard if they are ahead of schedule or not. Does anyone have any photos of the inside of the hotel? Would be interesting to see. My G.G. Grandfather, J. H. Redfield along with Asa Gray and others on a botany trip looking for Shortia Galacifolia spent several days in June 1879. It was having an addition put on then to bring it to 20 rooms. L.B. Searle (proprietor)was working on the road coming up from Wilder's Forge. 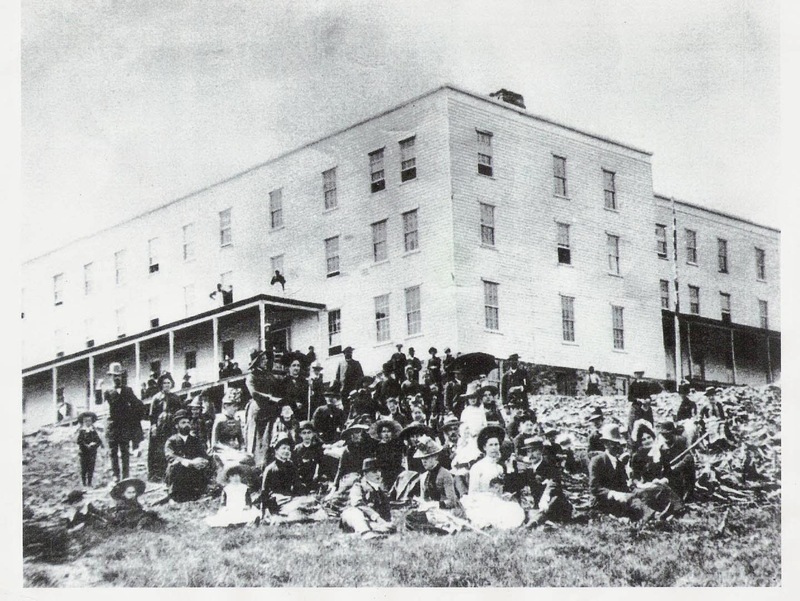 This was the first Cloudland Hotel, the housekeeping staff consisted of two cousins from Michigan. $2.00 per day, $10 per week. The hotel was built after the war, and NC and TN soldiers were on the same side. The line was to mark the state line, because NC was a dry state but alcohol was legal in TN, so to drink, the guests would drink on the TN side of the line. My GGrandparents were Honeycutts, and I was told that my GGrandfather was born in the hotel. As a distant cousin of the General I am finding all the facts about this Brilliant man absolutely amazing.